Time flies when you’re having fun. Has it really nearly been a year since we asked you to send your goals in for 2012? It seems so, and what a year it has been. With the huge success of Team Sky and Bradley Wiggins dominating virtually the entire professional race circuit, the gold rush at the London Olympics and Paralympics, and a British rider, Jonathan Tiernan-Locke winning the Tour of Britain, it has been a year the likes of which we may never see again. However, it’s been a bit of a mixed bag with our Project 2012 riders. Ups and downs is probably the best way to describe it. We’ve had records smashed to smithereens, personal bests eclipsed; we’ve had near misses, second places and even a drop out. Hopefully we’ve shown you real people with real lives who want to achieve real goals just like the rest of us. What’s more, we’ve also shown that however much hard work you put in, sometimes you need that a little bit of luck and good fortune. Here’s how Project 2012 went. But Jan’s goal wasn’t just to race a time trial – she wanted to win one. She chose the Bike Blenheim Palace time trial, a 20km course she knows well; she rode part of it when she raced the Blenheim triathlon months earlier. “The fastest woman in 2011 was 34 minutes,” said Jan. “She was 42 years old. I think with a bit of work, I can achieve that.” Here’s how she got on. “I had hoped to be the fastest woman of my age on the course, but unfortunately, it wasn’t to be, even though the conditions were in my favour – hot and humid – and the wind was slightly up at 10mph. Although I felt nervous, I still felt quietly confident, I went off fast, and maintained my heart rate up in race zone at 168bpm for the entire 20km of undulation. So I was a little surprised by my eventual time. “When I woke up the following day, I felt better. After a bit of reflection, I could see things a bit differently. I did a personal best for the course, shaving two and a half minutes off the course from last year and 30 seconds from the July triathlon time, which is quite a hefty chunk of time. “As far as coming second, well, there is always next year. I had been wondering what my next goal was going to be, as I always like to drive towards something, but I haven’t finished this one yet, which I suppose is a good thing. “I couldn’t have done all of this without the help, support and advice I have been given. Anthony provided me with a training plan and free nutrition, which was a huge help. The plan worked well for me, as I am so very structured. I’m not sure how I would have benefited if I weren’t as structured as I am. I spoke with Anthony on a number of occasions, and he was full-on and very inspirational. “That said, the benefits of having a plan certainly supported me achieving my goal. I feel a bit lost without one currently. There is no doubt I will continue with this level of focus, it’s a part-time job to be this fit, but I love it. “I wish everyone at Cycling Weekly the very best, and I cannot thank you enough for the opportunity you provided – a very warm and big thank you. “I was pretty stoked with her performance to be honest – even though she may have not have been at the time. From what I hear and the feedback she gave, she worked hard, and certainly held up her end of the deal. She shouldn’t be downhearted, and did her best. At the end of the day, you can only control your own performance and she certainly noticed some really interesting improvements. “We at Torq run our own software, and from that we are able to design specific programmes. At first, we worked on endurance work to build a foundation, which she was very good at anyway. Then we flicked the switch into speed and power work, and built it up towards the event itself. Jan was always comfortable with endurance riding, which is the polar opposite of time trialling, so it was important to make that shift. “I’d say go for it. Think about a realistic end goal and give yourself time to fully achieve that. If your chosen event is in a month’s time and you know you’re nowhere near that yet, then don’t fool yourself. It wasn’t just long hours that caused Alex problems. Alex had trouble setting realistic, achievable goals, and really needed someone to help make sure he kept at it. 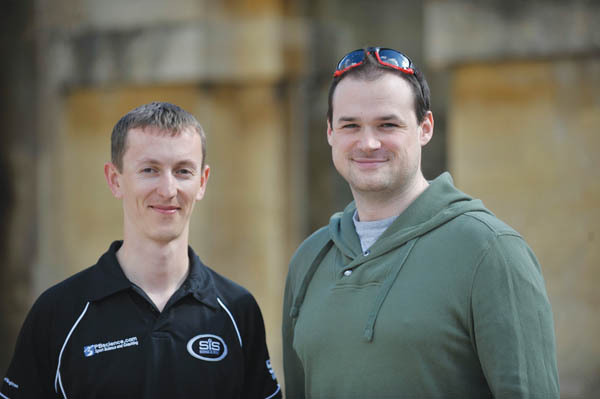 When Alex and Dan Henchy of PBScience first met, Alex was very enthusiastic: “It was good being able to talk through what my goals and aims are and how he can help me get there. He says I’m on the right track already, which is positive and it’s more of a case of structuring my training better, instead of me just going and riding.” Eight months on, was it all worth it? But it wasn’t his fitness that prevented Alex from finishing the Etape. “The organisers decided to close the road because of bad weather. If it had been open, I would have finished it – maybe not with a lightning quick time, but well under 12 hours, more likely 11. I was sticking to heart rate zones perfectly on the climbs and was going really well up the Aubisque. The Tourmalet was slower and more of a slog. I’d possibly expended a bit too much energy coming down off the Aubisque, but really needed to warm up as it was only about 4-5°C at the top and very wet. “On top of the Ausbisque and Tourmalet was the worst weather I have ever seen. At the top, we all froze and I blasted through to Soulan just to keep warm. The descent was horrific and I had to go slowly at the top then speed up as we went down. Loads of people were being treated for hypothermia at the feed station after the descent off the Ausbisque but I was just about OK as I had arm-warmers and splash top. “I will do it next year, and I’ll lie on the entry form to get a better start number. I’ll go to the loo beforehand and I’ll take the first climb a bit easier as I may have gone up and down the Ausbique a bit too quickly to keep warm. There were more than 200 of us waiting for the coach at the bottom of Aspin and many more abandoned before the Tourmalet. “With the Aubisque and the Tourmalet falling in the first half of the ride; Alex knew exactly the sort of effort level and heart rate he could maintain for the longer climbs from his training so we set this as the upper limit, with the aim of being able to finish strongly. “It’s clearly a disappointing result after all the hard work Alex put in, but it’s important to learn the lessons from what went wrong. The weather clearly played a large part but that is beyond our control, remembering to take a rain cape at the very least kept him from an ambulance. Starting so close to the back put Alex under immediate pressure and led to hold-ups simply due to the number of riders. “There are many. Alex lost a considerable amount of weight during his preparation and is now lighter and fitter than at any time since he left university. Just as pleasingly, after chatting with Alex, he’s down but not out and vows to continue the progress he’s already made and to go back next year and put things right. While it hasn’t been all plain sailing for the majority of our guinea pigs, Adrian on the other hand has been flying. Adrian emailed us almost immediately after seeing Project 2012 in Cycling Weekly, knowing this was too good an opportunity to miss. Adrian wanted to get back to the high standards he used to ride at, and in the process, shave time off his time trials and his waistline. He set clear goals; to get inside 24 minutes for 10 miles; to get inside 62 minutes for 25 miles, and to ride a 50-mile time trial in 2013. There was a lot to achieve, but as Adrian put it, way back in May of this year, “I’m not afraid of hard work and putting the effort it.” And going by the results he achieved, he certainly proved that. The results Adrian achieved are quite staggering. And it’s worth noting that the majority of this wouldn’t have been possible without the help of his mentor, Andy Blow of Votwo. Within two months of starting his programme with Andy, Adrian smashed his first goal, riding a 21-36 for a 10-mile time trial. Weeks later, he reached his second goal, riding a sub-62-minute 25-mile time trial. In fact, he didn’t just beat it, he obliterated it, coming in at 57-54 – more than five minutes quicker than his target time [and went faster again later in the season]. If that wasn’t enough, he also achieved his 2013 goal over a year early and is now the slimmest he’s been for a very long time. “The truth of the matter is that in the end it did seem quite easy,” says Adrian. “Don’t get me wrong, it has required a lot of application and dedication, but if Andy had sat down with me at Blenheim in March and told me that we would achieve all this, I would have never believed it. “The use of the ‘we’ is deliberate. Andy will doubtless make it clear that it was me that did all the hard work, but this would not have happened without Andy and Vikky, and all the continuous support, challenges and motivation they have given me over the last six months. “The highlights for me: breaking 22 minutes for 10 miles in June, and the close-to-PB ‘25′ in early August in terms of actual performances. 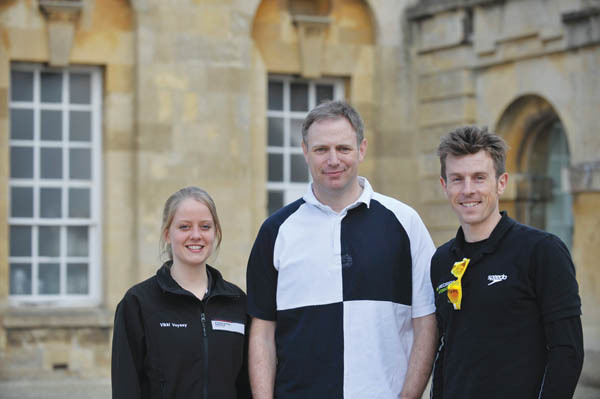 Other highlights: the gradual and controlled loss of weight and body fat to the point where I am now buying new suits, and seeing Andy stood by the start line at the Blenheim TT. “Having Andy to support me has been wonderful. We have generally spoken weekly, and he got a text after each race, even when he was in Australia, and there was always feedback. When the good performances started coming he was quick to keep me under control in terms of training when I wanted to push harder, and consequently we kept the ‘peak’ running for longer. “The relationship just clicked from day one, and I would now class Andy as a friend as much as a mentor or coach. I’ve also met his colleagues at Votwo who have taken a keen interest in our progress and I am sure that we will stay in contact in the future. “From the word go Adrian was an easy guy to work with from a coaching perspective. He had some clearly articulated and realistic goals. He knew how much time he could commit to training and had his season already mapped out. He also already trained in a methodical and reasonably consistent manner and was a reliable and honest communicator. “On the basis that his first stated goal was to lose around seven to 10 per cent of his body weight we tackled his nutritional intake from the very start. Although many athletes like to try to train excess weight off I am a firm believer in the power of combining good nutrition with training to get to a desired weight. “Although he claimed to be a fussy eater it was possible to see from his weekly food diaries that it would only need some relatively minor changes to kick start the weight loss, and within just a few weeks he was on track. In fact, I think Adrian reached his target weight after only about five weeks and continued to progress through the whole year, in the end dropping from 97.1kg and 25.4 per cent body fat in April to 85.3kg and 14.1 per cent body fat in September. “In terms of his performances on the bike Adrian derived a lot of benefit from a vastly increased power-to-weight ratio that saw him smash his target times early on in the year. In fact he got down to 21-36 for 10 miles and 55-25 for 25 miles by early August and both he and I were delighted with these results. “As Adrian heads into the winter he will be focusing on maintaining weight (so that he does not have to start the season next year with much to lose) and on increasing his speed for some masters track racing. You may recall Gary, a third-cat racer, who wanted to be more competitive in races. Gary was fed up doing nothing in races, and in the process, lost some of his motivation. We paired Gary up with Ashley Brown, founder of BBM Wellness and BBM Bikes and rider-manager with Team Sportscover/Altura. After an initial, promising meeting, communication unfortunately broke down between the two. When we spoke with Gary he was understandably disappointed, but wasn’t going to let it stop him from pursuing his goals.